Gus & Lula: Fabric Finds! Fabric.com - Dozens and dozens of options at good prices. Check out their clearance section, too! 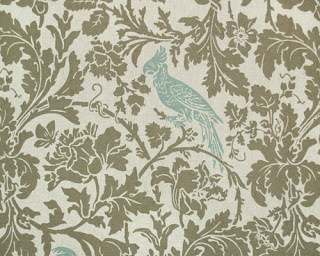 Warehouse Fabrics, Inc. - Great prices at this site, too, and a bit of a different selection. Housefabric.com - More expensive, but if you only need a yard or two, check out their remnant section. It changes fairly often and the prices are decent. Premier Prints - They make some of my favorite fabrics, and I just found out that you can buy directly from them. I used their Traditions fabric on my roman shades in the kitchen, Amsterdam on my old headboard, Houndstooth on a project I just finished, and I'm ordering the Barber print for an upcoming project. Just double-check the other sites once you've found a print you like - they may actually have it on sale for cheaper! Interior Fabrics - Decent prices, unique selection. Quilt Home - Mostly quilting fabrics, but some home dec. Huge selection and decent prices. If you're in the Atlanta area, check out Frugal Fabrics and Fabric and Fringe. There is also an awesome fabric "district" - check Lewis & Sheron, Forsyth Fabrics, and Peachtree Fabrics. They're a little pricier, but they're so fun to walk through! That is a great fabric. Have you ever gone to Fabric Guru (fabricguru.com)? They have some great clearance stuff and a large variety. Their down pillows are at a great price as well. Ooh! Thanks for the tips! I knew about Fabric.com, but some of the others are new to me. I just got done getting fabric for my bedroom window treatments too! I always forget about online sites though; wish I had read your entry today BEFORE I went shopping! Good suggestions! One day I am going to hide in the clearance room at Forsyth's until they close and spend the night in there. That's how much I love it. And I want the chance to look at my own pace with the whole place to myself.